This picture was taken at Bailey Homestead in Porter, IN. We were just walking around and I was using my new digital camera to take pictures. I didn't look at this pictures for several weeks till after we went back and ended up taking a tour. Once inside the main house I had a uneasy feeling and just wanted to leave, once returning home I uploaded the pictures of the house to look closely to see if I could notice anything. 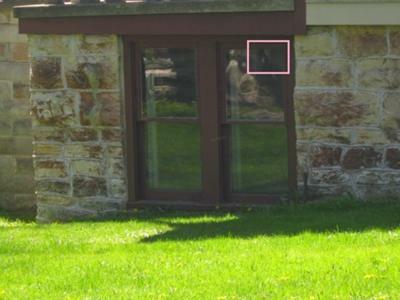 On one picture I noticed a figure that was taking of one of the lower windows. I highlighted it in a box and when I zoom the picture in there is a strange form of some type...not sure what it is. My husband and I go there almost daily to walk. We even bring our children to play in the homestead yard and picnic. We both feel very much at home there. I like to go and relax take pictures and enjoy the nature.I am sure the home is haunted whether or not its by the good or the bad that is debatable but I have felt nothing but happiness there. The house very much so is haunted. Joseph Bailey died and it was claimed he was insane. As a young man I used to take a group of us up there and saw all types of things through the years. One time blood on a sign post decribing the house. Another time when approaching the house, the outside lights came on. We ran like hell. Back in the car, we thought it might have been motion sensors, so we followed the exact same path up to the place as before. Wouldn't you know it, no lights came on. The place has a sinister feel to it. The grave site as well is spooky as all hell. In the daylight eerie, try it at night.